If you are a business owner, it is likely that you want to be everywhere and see everything at all times. Even when you delegate tasks and put employees in charge of managing the business while you are away, it is understandable that you want to keep an eye on things. Whether you have dealt with theft in the past and are now worried about future loss, or you just want to be able to peek at your business from time to time, installing a surveillance system is right for you. If you live in Colorado and are interested in having security cameras installed in your place of business, the experienced professionals at Visual Security LLC are here to help. We offer a wide selection of surveillance systems and installation services to ensure your system is installed quickly and efficiently. If you aren’t quite convinced that a surveillance system is right for you, here are the top reasons why your business needs security cameras installed today. If you have fallen victim to theft, in the past, you know how upsetting and frustrating the after-effects are. Perhaps you had employees steal money from the register, customers steal products from the sales floor or maybe you have been noticing discrepancies in bookkeeping—by having a surveillance system installed in your business, you can prevent these thefts from happening, or at least be able to figure out who the assailant is. No one wants to believe that dishonesty and theft occur in their place of business, but the sad truth is that theft is a very real and immediate problem. Take the precautions to prevent theft before it happens by having a surveillance system installed today. Even if you have the most trustworthy and loyal employees in the world, security cameras—much like locks—keep honest people honest. If you are a lucky business owner who has a great staff of loyal, honest employees, then they deserve a space and secure space to work in. Some businesses stay open late, meaning employees will have to walk to their vehicles when it’s dark. Other businesses may only have one or two people working in the office if business is slow. Whatever the case may be, having security cameras in the workplace will give you and your employees peace of mind knowing there are an “extra set of eyes” monitoring the safety of your team. When it comes to customers, there are a multitude of unexpected problems that can occur, and in many cases, these issue will be more easily resolved if there is video footage to review later. For example, if a customer gets injured in your business and attempts to sue, you can go back and review recorded video to determine whether their story is accurate or fabricated. Or, if a customer and one of your employees has a disagreement, you, as a business owner, can review the recorded surveillance footage to determine what kind of action needs to be taken. In short, a surveillance system dramatically reduces your liability, and when it comes to business, isn’t that something we are all looking to do? 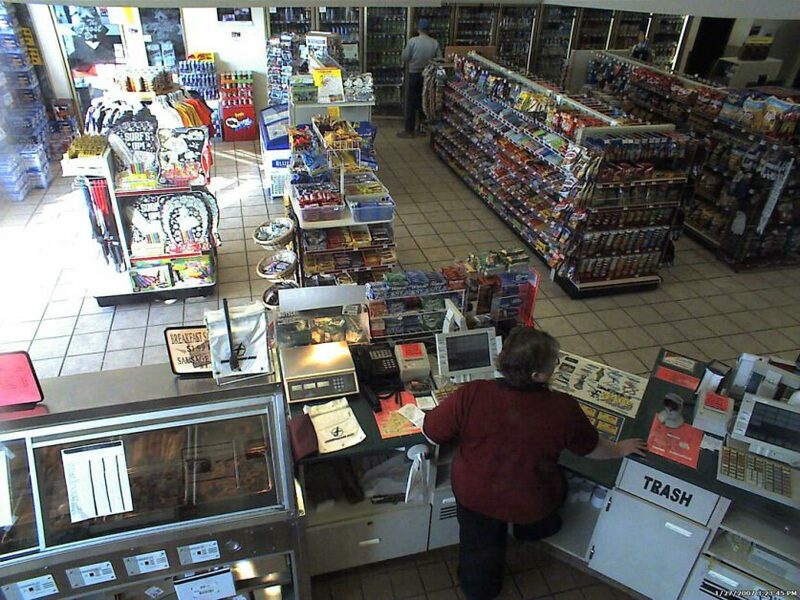 Hopefully no serious crime is ever committed in your place of business, but if it is, video surveillance will be a sure fire way to build a case against the assailant. Even if a crime takes place in the parking lot of your business and you have security cameras installed around the perimeter, you may be able to provide someone else with evidence that will be extremely helpful while the case is under investigation. There have been many instances of people who were attacked or robbed in parking lots, and security cameras in the area recorded crucial evidence like license plate numbers to help police solve the crime. If you aren’t fully onboard with video surveillance and prefer the human alternative—security guards—then you are probably spending a lot of money unnecessarily. By having a surveillance system installed by the professionals at Visual Security LLC, you will save yourself lots of money that you have been forking out for less effective solutions. Security cameras work all day and all night, opposed to security guards who typically work only when your business is open. The surveillance systems that we offer and install have amazingly clear night vision options, so even if you wake up in the middle of the night and want to check on the status of your business, you can! Additionally, security cameras can be installed anywhere you like, and you can choose as many or few cameras as you would like. This means you will have eyes on all parts of your business, rather than a single set of eyes in only one corner of the floor. Most other companies that offer surveillance solutions provide customers with “cookie cutter” systems that may not fit your needs, specifically. At Visual Security LLC, we offer custom surveillance systems that will meet your individual needs, so you can choose all of the features you want without having to include features you find unnecessary. We all know that when the boss is around, employees work harder and more efficiently. As a business owner, even if you are not able to physically be watching over your employees, having “eyes in the skies” is enough to remind your employees that you are able to check-in on them any time you would like. On the same note, having security cameras installed will ensure employees are following proper opening/closing procedures, enforcing new policies and managing newly instated protocols. In no way are we suggesting you use the security cameras to “spy” on your employees. Instead, we recommend using the cameras to motivate your employees and to help find aspects of your business that need improvement. Use your surveillance system to better your business and help it work more smoothly and efficiently. When it comes to attracting customers and ensuring they enjoy their shopping experience, you need to make sure all parts of your business are clean and running efficiently. With a surveillance system, you will be able to remotely view the cleanliness of the interior and exterior of your business. Is there trash or debris outside the storefront? Are there people loitering near your business? Is the front door unlocked or are people waiting out front to get in? These are all important things to consider, especially because appearance is essential when attracting customers. Inside your business, you can monitor things like: how well the shelves are stocked, how clean the sales floor is, whether the store is staffed properly and whether customers are being attended to or looking for assistance. Ensuring your customers have the best possible experiences should be your priority, and with a surveillance system in place, you will be able to guarantee positive relations, even if you are not physically present in the building. Vandalism and graffiti are violations that could cost you thousands of dollars to clean up. If the vandalism is extensive, you may even have to close your doors while the damages are repaired. Most vandalism occurs in public places that are in plain site, which means even if your business is in a high-traffic area, it’s not guaranteed you are safe from acts of vandal. In this sense, the only way to really protect your small business from vandalism is to have a surveillance system installed. With high-definition technology, it is easy to distinguish facial features and people’s dress, making it very likely that you will be able to either catch the vandal or have the police stay on the lookout for someone who resembles the assailant caught in your video. It’s a win-win situation. At Visual Security LLC, we have an extensive array of high-quality surveillance equipment. All of our security systems are customizable to ensure you are getting the perfect setup for your business. We also offer free property surveys to determine how many cameras your business needs and where each camera should be installed. We also offer lease-to-own programs if you are uncertain whether you would like to own a security system. For all of your surveillance needs, call the experts at Visual Security LLC. We can answer any questions you may have and look forward to providing you with a free property survey! Give us a call today!